Cachao Y Su Orquesta pictured during a historic recording session included in the new box set The Complete Cuban Jam Sessions. Historic Panart Records sessions have been remastered and collected in a new five volume set. 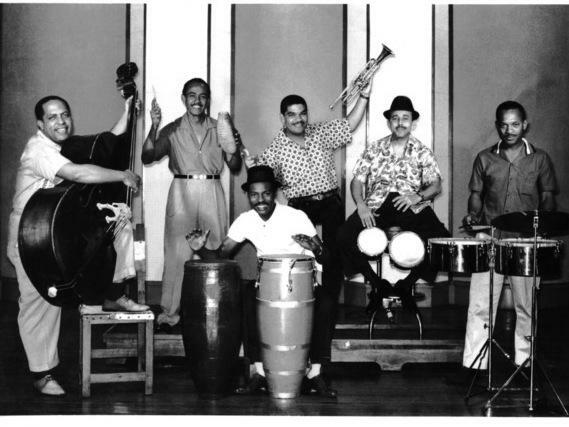 The Complete Cuban Jam Sessions were recorded at various locations around Havana from 1956 to 1964 for the historic Cuban label Panart Records. The five volume collection includes the definitive must-haves among Cuban jazz aficionados, Cuban Jam Sessions in Miniature "Descargas" by Cachao Y Su Ritmo Caliente. If there was ever a Holy Grail of classic Cuban music, this collection would be inside. Havana during this time span was a hotbed of musical activity and innovation. The demand for entertainment was constant in the nightclubs, concert venues and the bigger entertainment spots like the legendary Tropicana Cabaret that featured large orchestras and floor shows that included elaborate dance revues. When those musicians were done entertaining the audiences, they gathered at jam sessions, or descargas, to entertain themselves. That's where these recordings were made. Our guest this week is the album's co-producer Judy Cantor-Navas. She explains that while these sessions were principally friendly gatherings to relax, the hindsight of history shows them to be incubation chambers for the combination of Afro-Cuban music and jazz. You can hear musicians working on a riff at the beginning of these recordings then quickly assigning parts to instruments which laid rhythmic melodic foundations for improvisations that were just as cutting edge as those heard in New York during the same time period. In fact, New York and Havana were always connected by a free flow of travel between the two cities. These recordings also serve as historical record because the U.S. shut down relations with the Cuban government in 1964, the date of the last sessions on these recording. But of course, the politicians couldn't stop the jamming, as we explained in this episode of Alt.Latino and the give and take continue to this day. That's why these recordings are so important: They are a ground zero of a creative alliance that shaped music on both sides of the Florida Straights and are heard here for the first time in a glorious, digitally remastered sharpness that sounds as if they were recorded just last week. Craft Recordings is responsible for unearthing these treasures and have announced a staggered digital release schedule for The Complete Cuban Jam Sessions that leads to a full releases on Nov. 9. Enjoy Alt.Latino's Cuban Jam Sessions Playlist below.